Sorry, no picture in this posting, I moved to the new hosting but somehow I was not backup properly from the old hosting provider. I have been working with Motorola MC 3190 for some time and following are the troubleshooting you need to know when working with this scanner. I write this post to remind myself if I found the same problem in the future. Any other troubleshooting and solution are welcome. Symbol was acquired by Motorola, later Motorola was acquired by Zebra, so if you are looking for product of Symbol or Motorola you will end up at Zebra website and this is normal. Choose security mode: Legacy (Pre-WPA) if you will use WEP if not you can choose other options. Don’t tick Obtain Device IP address Automatically, you will need to specify IP address individually for each scanner. Enter your IP Address details, tick option Set static DNS Address (Optional) if you want scanner to recognize name instead of IP address. Enter IP address your DNS server, usually the same with your Domain Controller IP address. Copy the file under \application in the scanner, double click and when asked for confirmation click YES. 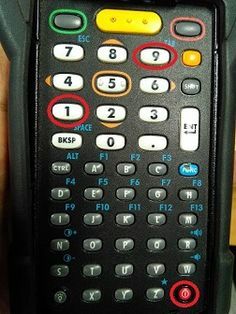 For cold boot you can press key 1+9+Power simultaneously, you will need to calibrate your screen again after cold boot. Any software changes will also be wiped out unless you make it persistent. If your scanner hang and warm boot not applicable, you will need cold boot. For warm boot on MC3190 you can press and hold power button for at least 15 seconds. You don’t need to calibrate screen and all software changes will retain. For other type of scanner like MC3090 warm boot can be done by pressing 7+9+Power keys. Using this program is simpler, make sure scanner MC3190 on IPL (Initial Program Loader) or Monitor mode by pressing 2 yellow button on the left and right side simultaneously and choose download from USB. The program will only refresh the OS by cleaning programs. No OS upgrade process occurred. The update will take about 1 minute to complete. Please do not remove the device from A/C power during this time.